Not all equipment is going to be used in bright conditions where everyone can see the printed graphics. In our busy lives we interface with appliances with little to no room lighting, such as, our washing machine, microwave, or even the call button on airplanes. Many of these utilize one of the three primary methods of membrane switch backlighting: light guides, fiber optics, or electroluminescent (EL) panels. This overview will go into the advantages of each method and when to use them, if you are looking for a general membrane switch construction you can check out that blog here. The root concept of fiber optics was originally discovered in 1842 when Daniel Colladon invented a “light fountain”; a method of transmitting light via water. Sectors including communications, sensors, and power transmission all utilize Fiber optics; however, its role in membrane switch backlighting brings back the technology to its roots; transmitting light. Fiber optics benefit from reduced power consumption over light guides and LEDs and a more uniform color than electroluminescent panels. We have a strong relationship and history with, Lumitex, one of the core innovators in the interface lighting segment. Through this partnership, Sigma 6 and Lumitex have delivered several high-use applications ranging from the medical industry to commercial luxury items. Light guides are a relative of fiber optic applications. This membrane switch backlighting method typically utilize side-firing surface-mounted (SMT) LEDs to shoot light into a panel that has a structure similar to fiber optics panels. Light guides allow for a wide variety of colors from a single LED. While light guides provide some of the best customization options including color and brightness, they can be costly when done at extremely low quantities. A light guide may have a customized optical pattern; often providing better brightness than fiber optic and electroluminescent panels. Electroluminescent (EL) panels primary advantage against light guides or fiber optics is cost. EL panels have a historical advantage over the other options; General Electric has a patent dating back to 1951 for Electroluminescent cells. This lengthy history has refined the production process of these panels to make them extremely cost effective, especially in bulk. While EL panels excel at cost they suffer in other areas; for example, light guides & LEDs have a life cycle of 100,000 hours where as EL panels last for about 16,000 hours. EL panels have some issues with maintaining brights upon reaching half life but, as discussed earlier, they are cheap to replace.Ultimately, electroluminescent panels are a reliable low-cost membrane switch backlighting application. Adding backlighting to your membrane switch design is an easy way to impress your customers and improve quality of life. 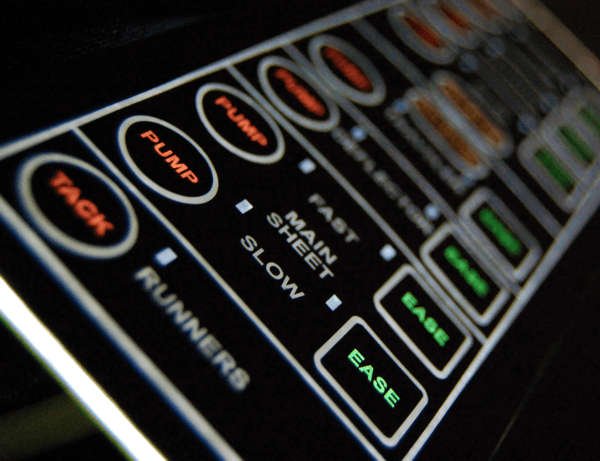 Sigma 6 Electronics has been manufacturing membrane switches and components for over 15 years and is ready to assist you in your next project. Contact us if you are interested in a quote!